Apparently it’s not just in PeyongChang where records are being broken this month. Solar cells are also setting the world alight (pun intended). For those readers who want to dig into the details (some might call it getting into the weeds or going down a rabbit hole, but to each his own) we’ve provided links to some of the information referenced here. But the point of this article is not the individual details but accumulation of them which shows that there is an awful lot of time and money being spent on increasing the efficiency of solar cells and that there are a lot of successes that seem to come increasingly quickly. January 16, 2018: Most hybrid-perovskite solar cells contain lead, which is toxic. Loi’s group has developed a record-breaking 9 percent efficiency in hybrid-perovskite solar cells that contain harmless tin instead of lead. January 25, 2018: On January 18, 2018, LONGi Solar announced that, according to a test conducted by TUV-SUD, the independent third-party certification test organization, the company’s 60-cell PERC module achieved a photoelectric conversion efficiency of 20.41%, a new world record for a monocrystalline PERC module. February 2, 2018: Hanergy Thin Film Power Group Limited (HKSE Stock Code: 566) today announced that Fraunhofer ISE CalLab PV Modules, a German solar energy testing laboratory, has rated its US-based subsidiary Alta Devices‘ newest solar production module as the highest efficiency single-junction solar module ever produced. February 2, 2018: TÜV Rheinland, a German testing laboratory, has rated Hanergy’s Germany-based subsidiary Solibro’s double glass copper indium gallium selenium (CIGS) solar module as the most efficient glass substrate CIGS module in the world, with a record 18.72% aperture area efficiency. February 6, 2018: The Institute for Solar Energy Research Hamelin (ISFH) and the Leibniz Universität Hannover demonstrated the fabrication of a crystalline silicon solar cell on p-type wafer material with an independently confirmed energy conversion efficiency of (26.10 ± 0.31) % under one sun. This is a world record for p-type Si material as well as a European record for crystalline Si. Part of this is that the records are specific to different kinds of solar cells or panels – PERC, GaAs, Perovskite, CIGS modules… and that the more specific the definition the more you can claim a record. But still. This also doesn’t take into account all the news about promising research into different materials and techniques with the goal of making solar power more efficient, better, cheaper and more flexible. 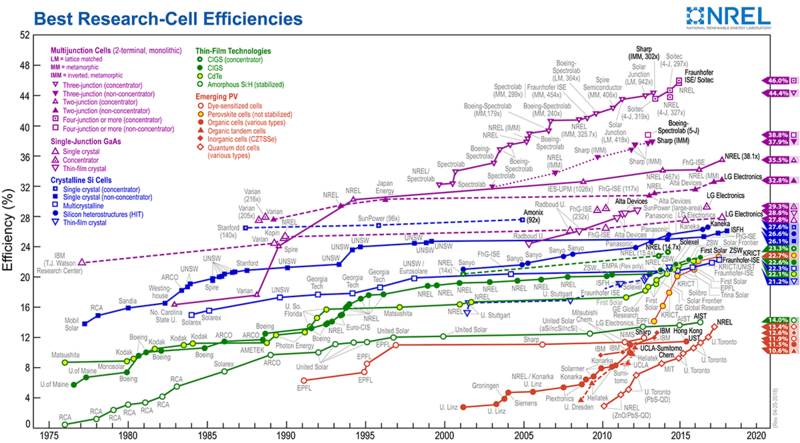 Many researchers and companies feel that silicon (which is the ‘active ingredient’ in most solar cells) and the way it is used now is reaching the limits of what it can do, so here are some other places to look for new records in emerging technologies. Heterojunction cells are a specific kind of multi-junction cell that use silicon in a sort of ‘layered’ way that basically expands the spectrum of light that can be turned into electricity. But before WE get lost in the weeds, let’s look at the important part. The historical charts of efficiencies rising and prices falling. And in contrast, here is a chart from Bloomberg New Energy Finance of the price of solar cells – per watt – from 1977 to 2013. That was 5 years ago The price is even lower now. Solar cells are only the building blocks of solar power, they get made into panels which get made into arrays that go on a building or make up a solar farm. And there are obvioously other construction costs involved when such a farm is built. but to give you an idea of what is going on in that area, the record low bid price for solar power was reached in November of 2017 in…Saudi Arabia. Yes, Saudi Arabia. The world is changing. Quickly.